The Commander is Brococks latest addition to their range and carries along the companies penchant for high accuracy and astounding build quality. The Commander features a buttery smooth side lever action as well as Huma Regulator that ensures the same muzzle velocity, no matter the amount of air left in the tank. This eliminates the so called "power curve" of regular PCP rifles and ensures the Commander stays consistent in its shot placement from beginning to end. 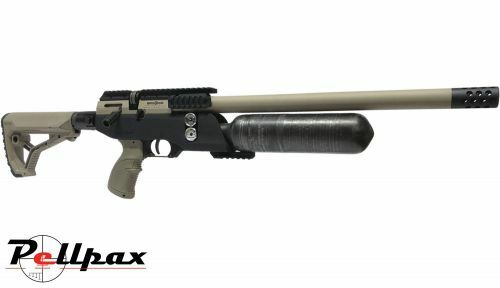 The rifle is fitted with a variety of accessory rails to allow you to customise the gun a little or as much as you wish. The adjustable two stage trigger is crisp and predictable and the 10 magazine of the Commander cycles quickly and easily for rapid follow up shots. The Commander also comes complete with a single shot tray.